The HBO documentary, “Banksy Does New York” reviews the anonymous British street artist’s month-long New York “residency” where, in October of 2013, he generated a new work every day for a month, in all five boroughs of the city. In a brief segment of the film, I discuss the artist’s engagement with the writings of Hannah Arendt. 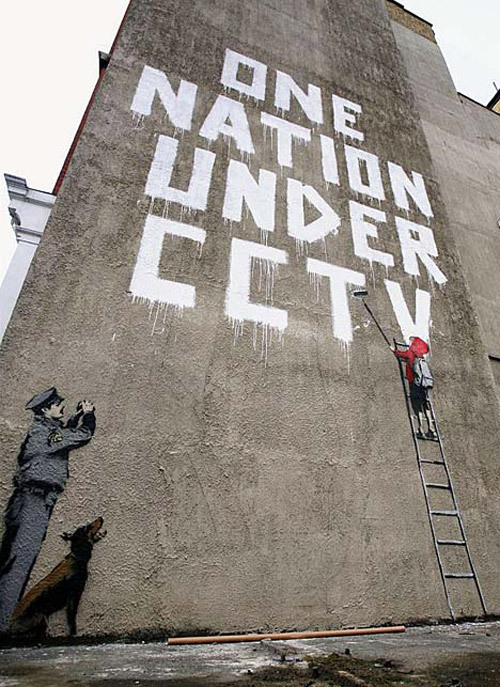 The text is part of a lecture, “Banksy: Completed,” in which I follow his clues to reveal the philosophical origins of his work, given in the past year at University of Southern California/Fullerton, the Berkshire Museum, and the University for the Creative Arts in Canterbury, UK. 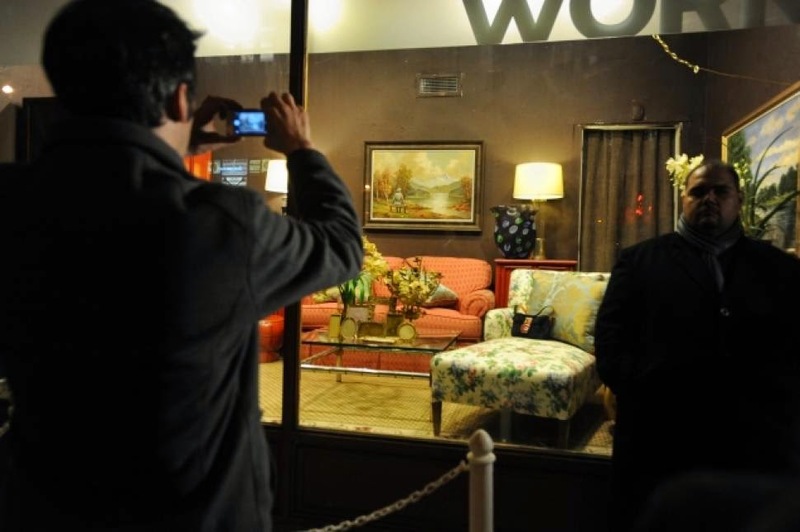 For Day 29 of his unsanctioned sojourn in New York, Banksy repurposed an original artwork, an overwrought pastoral oil painting purchased for $50 from a thrift store. With his painted addition of a solitary Nazi officer seated in contemplation on a bench, the scene of an autumn forest by a river with snowy mountains in the distance is transformed from kitsch Americana to Caspar David Friedrich-esque German Romanticism, the falling yellow leaves now signifying the decline of the Nazi regime as well as a warning, perhaps, of our own social and political decline. Scrawling his signature under that of the original artist, Banksy, on his website (which existed only for the duration of the “residency”), entitled the work "The banality of the banality of evil, oil on oil on canvas, 2013," and described it as "a thrift store painting vandalized then re-donated to the thrift store," with the intention that the proceeds go to the Brooklyn-based nonprofit that benefits homeless people living with HIV/AIDS. Housing Works auctioned it off and ultimately, after much bidding drama, netted at least $450,000. On the Village Voice blog, writer Raillan Brooks no doubt Googled “the banality of evil” to discover that it was associated with Holocaust survivor and philosopher Hannah Arendt’s “theoretical reckoning of the Nazis' rise to power.” Brooks, concluded, however, that it more likely had “something to do with Banksy not really caring much about what he's actually saying”—when it’s clearly the theme that underlies all his subversive enterprises. This concept is at the heart of Bernhard Schlink’s 1995 novel, The Reader, later made into a film. One of two main characters, Hanna, is being tried for war crime, but she’s not an officer, nothing like it, simply a guard who never considers the possibility that she could defy orders and unlock the burning church in which most of her prisoners die. Like Eichmann, what’s chilling about Hanna is her ordinariness; she’s just doing her job. Arendt suggests that evil is more accidental than intentional, less a result of ideology and conviction than a by-product of petty ambition and the drive for personal security. Ironically, while railing against this failure of humans to question their environment, Banksy consciously uses it to his own ends. Not one to skulk around in a hoodie, as he appears in his 2011 film “Exit Through the Gift Shop,” one of his methods for avoiding detection is to look as official as possible. To “turn invisible” he recommends a high-vis vest, hardhat, clipboard, and business cards—not to speak of three stories of scaffolding under a CCTV camera. It is therefore significant that Banksy’s Nazi officer is not depicted as an ogre, but a lover of nature, which makes him all the more normal and therefore frightening. In that context, Banksy’s entire crusade can be seen as one against what Arendt called a “failure to think” or, in other words, mediocrity and banality in all its forms. The greatest crimes in the world are not committed by people breaking the rules but by people following the rules. It's people who follow orders that drop bombs and massacre villages. As a precaution to ever committing major acts of evil it is our solemn duty never to do what we're told, this is the only way we can be sure. By now everyone knows that TIME’s Person of the Year for 2011 is “The Protester” and that Shepard Fairey created the cover. Those who’ve followed this blog for a while know that I worked as a consultant for TIME on the covers for over 20 years, and introduced Fairey to TIME in 2007, when he created an image of Putin that ran on the inside (see post here). While the Person of the Year, along with the magazine itself, no longer has much cachet, I’m still glad TIME made a good call (over, say, Kate Middleton for getting married or Steve Jobs for dying) as it represents formal recognition that this is a massive, worldwide movement—unlike the New York Times, which is still waiting for Occupy to go away so no one will notice that they haven’t been covering it. Although it’s had the Internet on fire for weeks and was a headline today in Britain’s Guardian, another event the New York Times (along with the rest of the mainstream media) hasn’t covered is the hasty passing—ironically on 220th anniversary of the Bill of Rights—of the latest iteration of the National Defense Authorization Act, which many feel compromises our most basic American rights to due process. But you can learn about it on the Huffington Post, and if you need a laugh to mitigate the fright, on The Daily Show. Meanwhile, in the art world, I received a press release today announcing that Gagosian will be showing ALL of Damien Hirst’s dot paintings (they call them “spot” paintings) in ALL of the eleven Gagosian Galleries throughout the world—Paris, Athens, Geneva, Hong Kong, London, Rome and New York. Now there’s an event to stay home for. My opinion as a critic is, if you’ve seen one dot painting, you’ve seen them all. You can quote me. 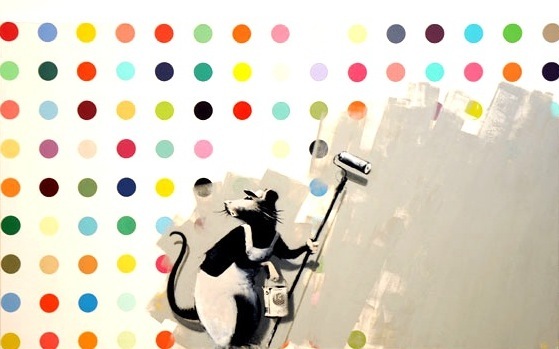 Banksy's take on Hirst's dot paintings.